Last week we looked at Viejito masks from Cherán and Uruapan, Michoacán, masks with amusing and highly stylized features. Just as we have seen with Curpite and Negritos masks, those used by Viejito dancers also demonstrate a range of designs. The differences are sufficiently pronounced to have misled dealers and collectors to label some Viejito masks as being from entirely different dances. 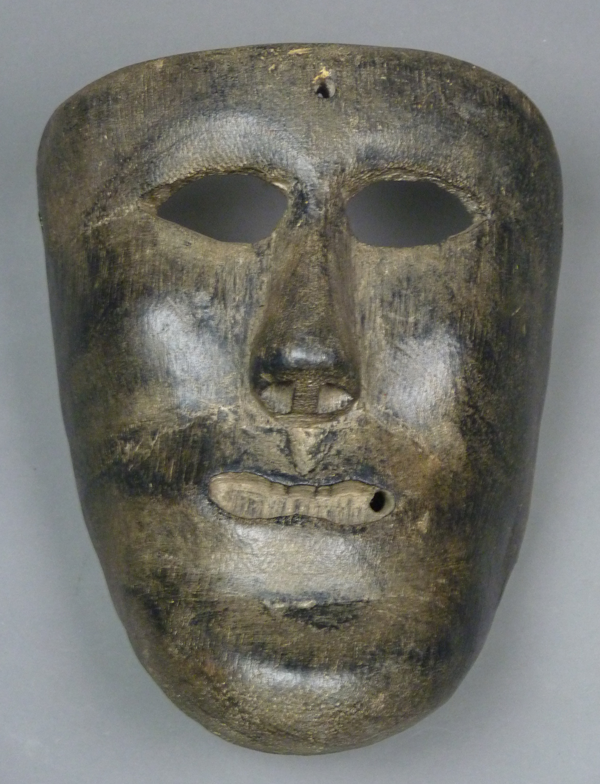 Part of the problem has been that modern carvers have been more ambitious, creating fancier masks. The ready availability of YouTube™ documentation, when combined with photos from the few available illustrated books, allow one to at least begin to sort out this mystery. Today’s first mask, which I bought from René Bustamante in 1994, listed this provenance on the tag—”Uricho, Mich.-Dia del levanta y niento del Niño 2/2.” The Christian feast of Candlemas, also called “The Presentation of the Infant Jesus,” occurs each year on February 2, 20 days after Christmas day. In the past, February 2 was actually considered to be the first day of the New Year. Searching on YouTube™ and in Calendario de Fiestas Populares (1988), I did not find any references to masked dances in San Francisco Uricho. The second and third masks, also obtained from René, were said to be from Purépero de Echáiz, and for whatever reason, I thought of all three as Españoles (Spaniards). One of these is obviously by the same hand as the first, while the other is only slightly different, as if from the same tradition but another carver. The Calendario reference book did confirm that Viejitos dance in Purépuro, but there was no listing for Viejitos at Candlemas. That reference book did confirm that many towns in Michoacán celebrate Candlemas with some sort of fiesta, and a YouTube video from Sicuicho, Michoacán showed Viejitos dancing on February 2 while wearing masks similar to the third in today’s group. Therefore I conclude that these first three masks were worn by Viejito dancers in that area of Michoacán. San Francisco Uricho and Sicuicho are about 100 miles apart, while Purépero de Echáiz lies in between, about 60 miles from either one. The link that follows features Viejitos dancing on Feb 2, 2017 (Candlemas) in Sicuicho. Note that Maringuilla is represented in this town by three unmasked women, rather than by men wearing female masks. Further review of the Purepecha Masks 2002 Catalogue reveals that smiling Caucasian faces with golden hair (but lacking relief carved ears) can represent other dance characters, such as Kings, “Black Men,” Tare Andari, Monarcos, and Hermitaños, depending on the town. This type usually has golden hair, mustache, and beard, while the other style of mask lacks hair altogether and requires the attachment of a wig. Because I will be showing several masks from Turícuaro, Michoacán, I will begin with a Youtube ™ video of Viejitos from that town. In the middle section Maringuilla dances. The photographic quality of this video is only fair, but the performance is so much more authentic than many others on the internet that are being performed by folkloric companies. Today’s first mask was collected in Michoacán by Dinah Gaston. I purchased it from her in 2000. Janet Brody Esser included a photo of a nearly identical mask in her 1984 book, Máscaras Ceremoniales de los Tarascos de la Sierra de Michoacán (page 109, figura 32.) Esser stated that the mask in her book was carved by José María Ponce of “Torícuaro,” [Turícuaro] Michoacán, in about 1970, she took this dance photo in Patzcuaro on July 8, 1971, and the dancer wearing this mask was from Janitzio, Michoacán, an island in Lake Patzcuaro. Turícuaro is about 50 miles to the west of Janitzio, demonstrating how these masks travel. 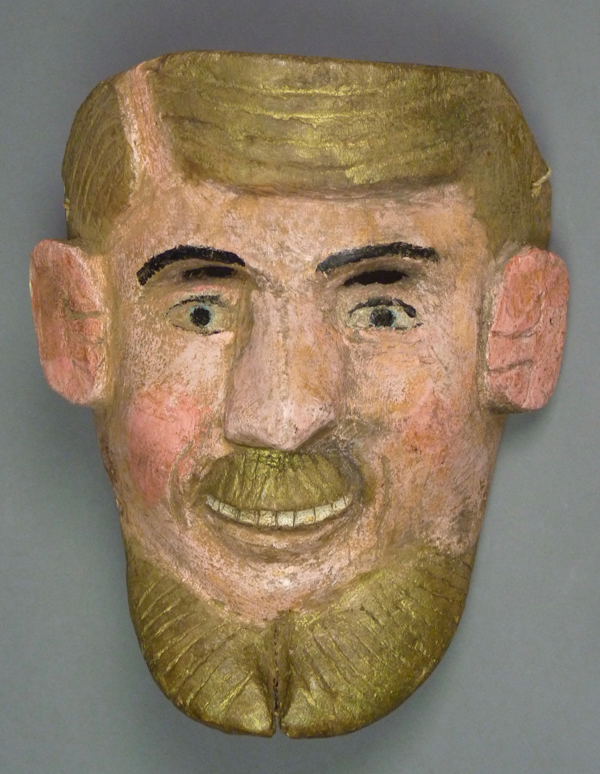 The Ponce mask has virtually identical features to this one from Dinah Gaston, including the hair, eyes, nose, cheeks, mouth, and chin. 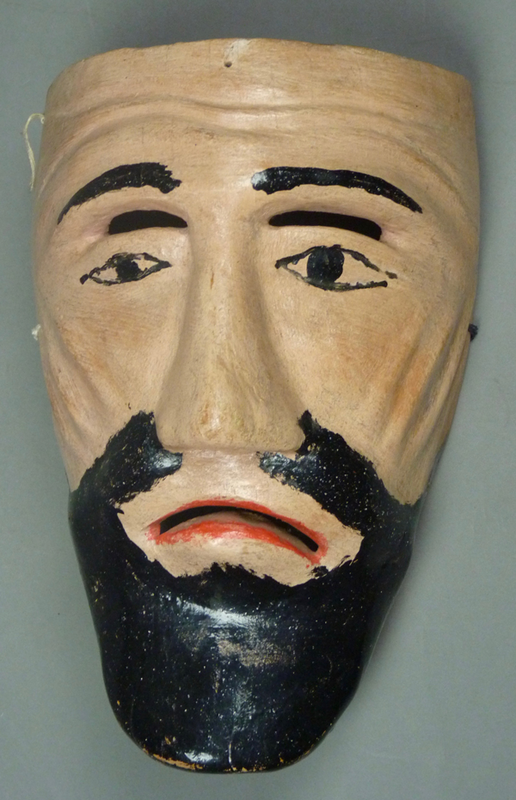 Therefore I am attributing this first mask to José María Ponce of Turícuaro. Isn’t it splendid! 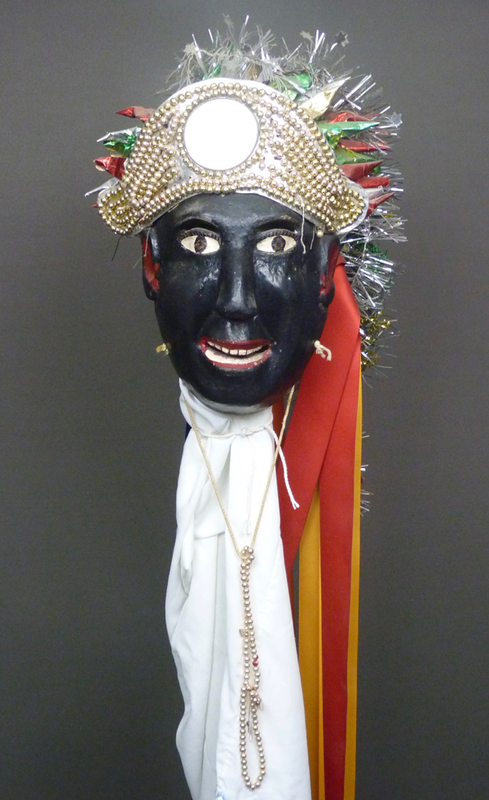 This week I will show some additional Negrito or Blackman masks from Michoacán. In her chapter about the Dance of the Blackmen, in Behind the Mask in Mexico, Esser (1988, pp. 107-141) reported that there was a history of Blackmen dancing with wooden masks in the town of Sevina (p. 122), but that the dance was no longer performed there with such masks at the time of her research (1970-1975). In my collection are three wooden Blackman masks from Sevina that I obtained from Jaled Muyaes and Estela Ogazón, in 1997 and 1999. 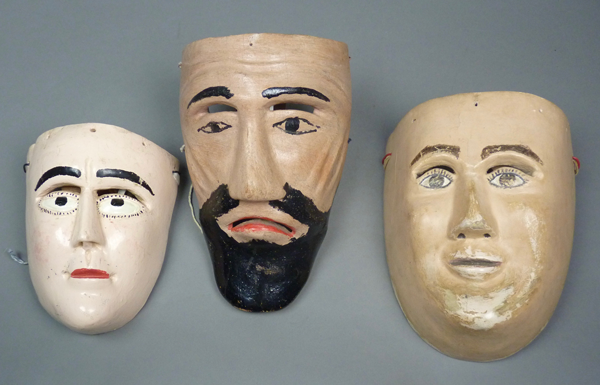 They had undoubtedly collected these masks in the 1960s or 70s, but obviously the three must have already been old and retired from use by that time. Here is the one I bought first, in February 1997. It is the most refined of the three. I call your attention to the unusual shape of the mouth. Also note that there is a hole that might have held a representation of a cigarette. The chin is knob-shaped. Long ago this mask was painted black, but it seems that that paint has nearly worn off. There are just three holes around the forehead. Janet Brody Esser was the editor of a superlative book about Mexican dance masks—Behind the Mask in Mexico (1988). In that volume she authored a chapter about dances and masks in the Mexican state of Michoacán that feature dance personages called Negritos, or “Blackmen” (pages 106-141). In my post of September 18, 2017 I included a mask from that dance of a Negrita, a female mask with a black face. In today’s post some of the masks have unquestionably male faces, while others cause one to wonder about the intended gender. I will start with a pair of Blackman masks in the style of Cherán, Michoacán. I purchased this pair from Jaled Muyaes and Estela Ogazón in 1998. The front piece of the headdress is made of metal, probably recycled tin. A mirror and strings of yellow beads are mounted on this plate. The plate itself is attached to the crown of a woven straw hat that is covered with cloth, and decorated with small cones of colored foil. Tinsel and ribbons hang from this headdress. Janet Brody Esser studied the masks and dances of this region of Michoacán during the period from 1970 to 1975. Her doctoral dissertation on this research, Winter Ceremonial Masks of the Tarascan Sierra, Michoacan, Mexico, was published by University Microfilms in 1978 in two volumes. A book based on this research followed in 1984—Máscaras Ceremoniales de los Tarascos de la Sierra de Michoacán, published by the Instituto Nacional Indigenista, in Mexico City. The advantage of the latter book is that it includes many of the same photos as those in the PhD thesis, but because these are printed rather than photocopied, they are better images. In these volumes Esser described a variety of related traditions, which reflected local customs and individual carvers. The masks in today’s post will illustrate some aspects of this variety. 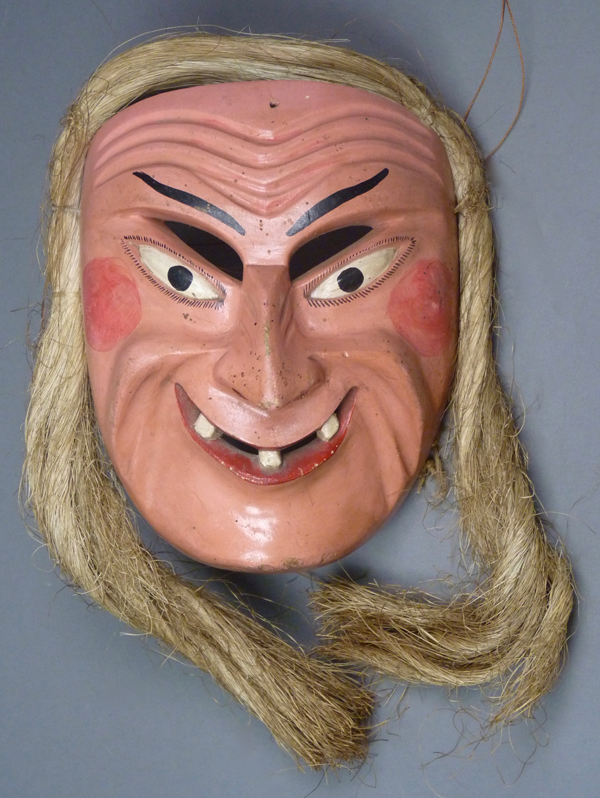 One focus of Esser’s research was on the masks of the Viejos, or Curpites (Esser 1978, pp. 60-134; 1984, pp. 57-121). When Dinah Gaston visited Zacán, Michoacán in the 1990s. she met an elderly carver there, Alejandro Sanchez Mercado Senior. She purchased masks that were made by Señor Sanchez Mercado for the Curpites dance and subsequently danced. Later she sold those masks to me, one by one over a period of six years. They are of interest because they look fairly different from those of Nuevo San Juan Parangaricutiro. At some point she bought several much older Tarépiti masks that had been repainted as Negritos/Blackmen, and I bought one of those. In the Máscaras Purepechas Catálogo 2002 survey there are masks by Alfredo Sánchez Mercado of Zacán, who may be the son of Alejandro. Here is the trio of masks that were purchased directly from the carver, Alejandro Sanchez Mercado Senior, by Dinah Gaston. I took this photo to demonstrate the disparity in their sizes. Maringuilla (on the viewer’s left) is so small in comparison to the Curpite (on the viewer’s right). Here is Tarépiti, or Grandfather. Note how different he looks, compared to the comparable masks from Nuevo San Juan. I bought this mask from Dinah Gaston in 2006. She had held him in her personal collection for years, out of affection for this elderly carver. Look how wrinkled and somber this mask is.